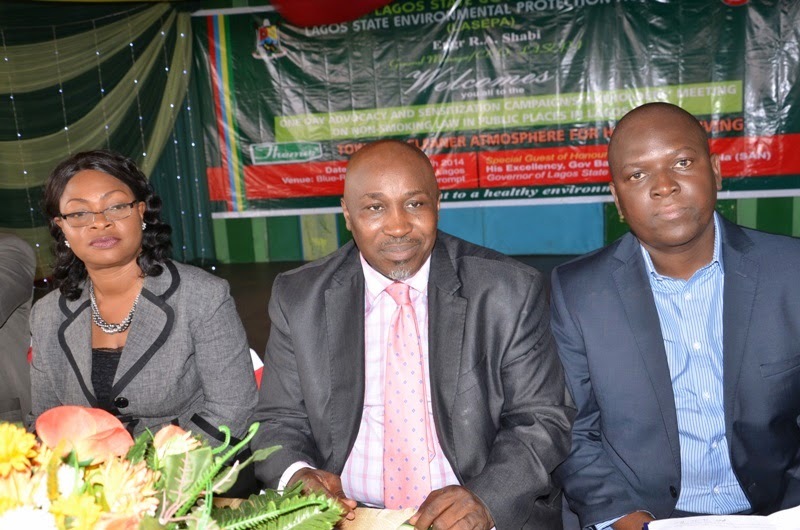 The Lagos State government and partners Tuesday hosted a one-day advocacy and sensitization campaign for stakeholders at a meeting in Ikeja-Lagos, reports NaijaAgroNet. This, NaijaAgroNet also gathered was in compliance to the recently introduced non-smoking law in public places in the state. Some of the speakers include Dr Yewande Adesina, Special Adviser to the Lagos State Governor on Public Health, Engr. Rasheed Shabi, General Manager/CEO, Lagos State Environmental Protection Agency (LASEPA) and Mr Sola Dosunmu, Head, Regulatory Affairs, British American Tobacco (BAT), West Africa. L-R: Dr Yewande Adesina, Special Adviser to the Lagos State Governor on Public Health, Engr. Rasheed Shabi, General Manager/CEO, Lagos State Environmental Protection Agency (LASEPA) and Mr Sola Dosunmu, Head, Regulatory Affairs, British American Tobacco (BAT), West Africa at a One-Day Advocacy and Sensitization Campaign/Stakeholders' Meeting on Lagos State Non-Smoking in Public Places Law, in Ikeja, Lagos on Tuesday.